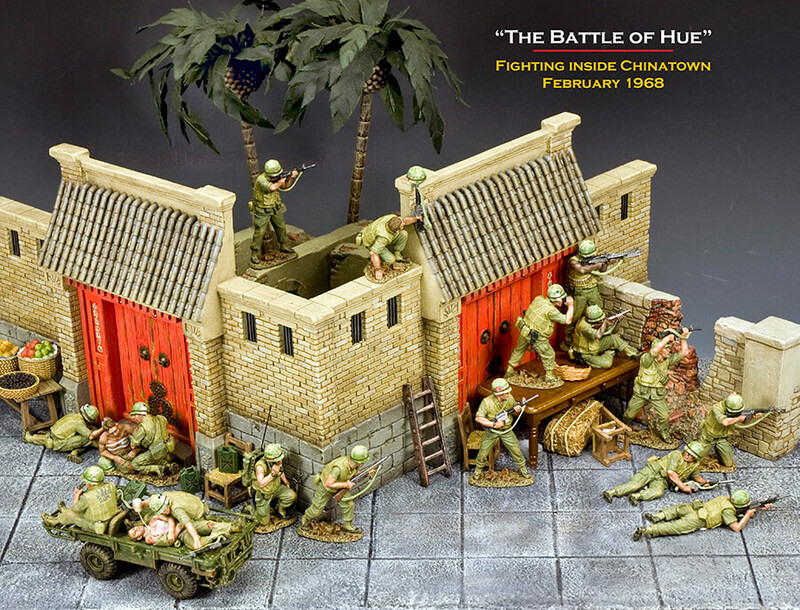 "The Battle of Hue continues"
"JOHN FORD’S MOUNTED U.S. CAVALRY"
"PACIFIC MARINE SPECIAL EDITION SETS"
WELCOME TO THIS MONTH’S ‘DISPATCHES’ and an apology for appearing a few days later than usual due to yours truly just getting back to HK from San Antonio and The Texas Toy Soldier Show. At the show itself we previewed in person our latest ‘VIETNAM WAR’ range of U.S. Marines in combat during the Battle of Hue which took place in the TET Offensive of 1968. 1. "THE BATTLE OF HUE CONTINUES"
VN017 "The U.S.M.C. M274 “MULE”"
The U.S. Military M274 1/2 Ton, 4x4 Utility Platform Truck was a 4-wheel drive gasoline – powered truck / tractor type of vehicle that could carry up to half a ton of weapons, ammunition or supplies with an off –road capability. First introduced in 1956 it saw plenty of action during the Vietnam conflict and remained in service until the 1980’s. As a completely open and exposed vehicle the M274, better known as “The Mule”, offered zero protection to the driver and was mainly operated in an infantry support role as previously stated. “Mules” could also be adapted to carry many types of conventional weapon including the M40 106mm Recoilless Rifle... TOW Anti Tank Missiles and even both the M60 and .50 Cal. Machine Guns. Our K&C model can carry a wounded Marine and a Navy Corpsman or a load of supplies... The “Mule” itself comes with its driver together with his M16. A seriously wounded Marine lies unconscious as a Navy Corpsman does his best to keep him alive and shelter his body from enemy fire... an M16 lies by their side. AL101 "Australian Light Horseman & Koala"
As reported at the time the Australian troops who left for the Middle East at the beginning of the First World War took with them all kinds of animal mascots to become favoured regimental pets, among them was the cuddly Koala... Here our Light Horse trooper gently cradles a small Koala. Several Koalas were brought over to Egypt with the Australian forces and although the animal’s favourite diet of Eucalyptus leaves were in short supply the Koalas were fed the same rations as the men’s horses... and appeared to thrive on it as well! Wearing the traditional peaked, four-pointed Polish military cap this officer takes careful aim with his automatic pistol at the advancing enemy. A 3-man rifle section opens fire on their German opponents... Their rifle is the 7.92mm Mauser 1898, itself of German origin but built under license in Poland. Each infantryman carries at least 90 rounds of ammunition in his six pouches as well as a full backpack with rolled and folded blanket. FOB167 "MG08 Machine Gun Team"
This 2-man set operates the MG08 or Maschinegewehr 1908 which was originally the German Army’s standard machine gun of WW1. 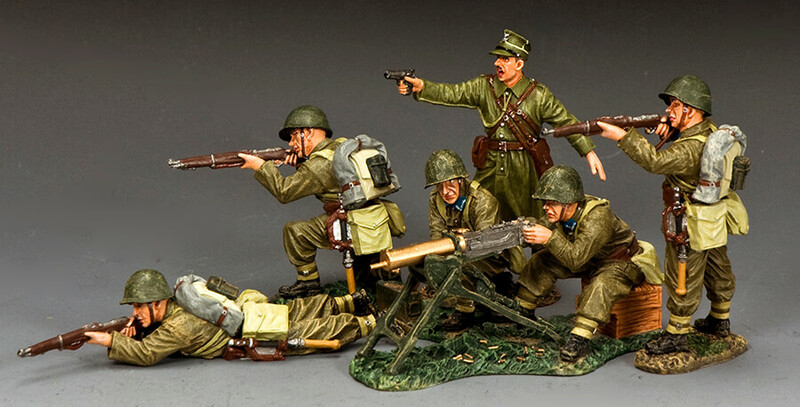 After the end of The Great War the fledgling Polish Army inherited much surplus German weaponry including the MG08 and during the 1920’s and ‘30’s purchased even more. Although heavy and not easily moved around the battlefield these guns were strong, accurate and relatively simple to operate. A noted archer and an avid poacher of the King’s deer until almost caught-in-the-act by some of the Sheriff’s men. Fortunately for Jack he fled into the forest and met up with one of the Merrie Men. Here Jack moves stealthily forward ready to ‘poach’ one of the Sheriff’s men! Another good bowman and a fine addition to the ‘Sherwood Forest Archery Club’... Fouke lets loose an arrow at one more of the Sheriff’s scoundrels. Once a respectable and respected forester Owen has been forced to flee to the woods to avoid the Sheriff’s punitive taxes and to help feed his family... A handy man with an axe and that is his weapon of choice. Arthur was about to be hung for the theft of a horse and stealing a bushel and a half of oats when he ran faster than the Sheriff’s men and into the depths of nearby Sherwood Forest. 5. "THE ENEMIES OF ROME"
RnB001 "Those Who Are About To Die"
A kneeling captured Gallic Warrior awaits his fate as a Roman Legionary stands over him with sword drawn and looks down on him pitilessly... Depending on the whim of the nearest Centurion this rebellious Gaul maybe sentenced to a life as a Galley slave ... Or death in the arena... Or even a swift exit right here and now! Cruelty on the battlefield was not only practiced by the Romans... This Celtic Warrior carries two decapitated heads on his spear both as a warning to his enemies as well as a blood-thirsty trophy to his fighting skills. This particular Barbarian warrior shields his eyes as he looks toward a distant Roman patrol marching through his tribal lands. RnB006 "Vercingetorix, Chief of the Gauls"
Vercingetorix (82BC-46BC) was the chieftain of the Arverni tribe, who united all of the Gallic tribes in a revolt against the Roman armies of Julius Caesar. A born leader and a brave warrior he and his combined forces defeated the mighty Caesar at the Battle of Gergovia in 52BC and forced the Roman general to withdraw... at least for a short time. Soon however, Caesar and his Legions returned and, at the Siege of Alesia, Vercingetorix and his Gallic tribes were defeated and the Chieftain himself captured. Vercingetorix was later taken to Rome and held captive for 5 years before being paraded in Caesar’s ‘Triumph’ and then, as was the custom of the time, publicly executed. The K&C figure is directly based on a magnificent seven-metre-tall statue of the Gallic Chief erected on the orders of Napoleon Ⅲ in 1865 on the supposed site of the Siege of Alesia. RnB007 "Caradoc, Chief of the Britons"
Caradoc , called “Caractacus” by the Romans was a 1st Century AD British Chieftain of Catuvellauni tribe, who led the British resistance to the Roman conquest. For almost 10 years, he combined ‘guerrilla’ warfare with set-piece battles to fight the might of Rome. After his final defeat he was handed over to the Romans and, like Vercingetorix before him was sentenced to death. Although a captive in Rome he was allowed to address the Roman senate. His speech made such an impression on the Senators that the Emperor Claudius himself pardoned him and granted him the privilege of living in peace in Rome... a rare honour indeed for a once rebellious leader! Something a little different from large, hairy barbarian chieftains!!! This foxy little ‘Legioness’ probably would never have marched with the Legionnaries themselves but would have been a welcome distraction in any Roman fort or campsite! RnB009X Available ONLY DIRECT from K&C in NOW! ALL OTHER FIGURES AVAILABLE: NOW! 6. 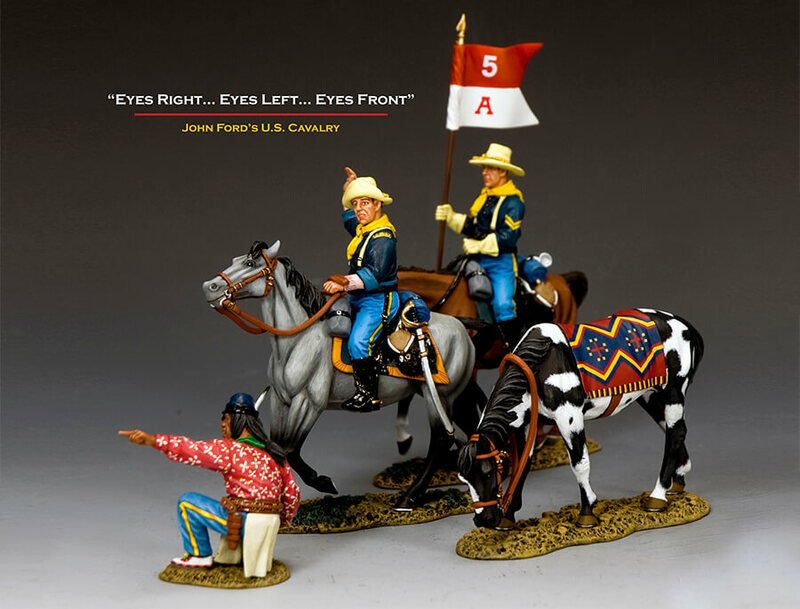 "JOHN FORD’S MOUNTED U.S. CAVALRY"
When we made the decision to ‘open up’ the availability of the original ‘John Ford’s Cavalry’ figure to ALL K&C Authorised Dealers around the world little did we know just how popular that would be … Well, following on from that K&C also received a fair number of requests for more mounted U.S. Cavalrymen to be produced to continue telling the story. So, here are the first TWO pieces that will soon be joined in the coming months by SIX more. All of these new figures were inspired by the work of one of Britain’s finest post war comic book illustrators of the 1950’s and 1960’s Denis McLonghlin. I discovered Denis work in the mid 1950’s when I first saw his illustrations in the ‘Buffalo Bill Wild West Annual’… His attention to detail and knowledge of the Old West and all its myths and legends was second-to-none. Later, I realized that Denis also obviously loved Western Movies especially John Ford ones! 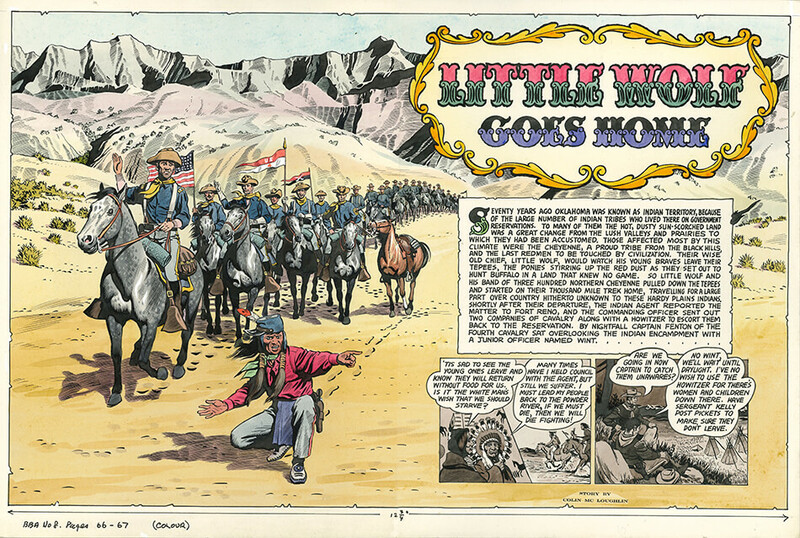 His U.S. Cavalry illustrations were often directly taken from some of Ford’s finest films, “She Wore A Yellow Ribbon”… “Fort Apache”… and “Rio Grande”. The illustration at the start of this section of “DISPATCHES” shows a cavalry column similar to what K&C is going to be releasing now and over the coming months. 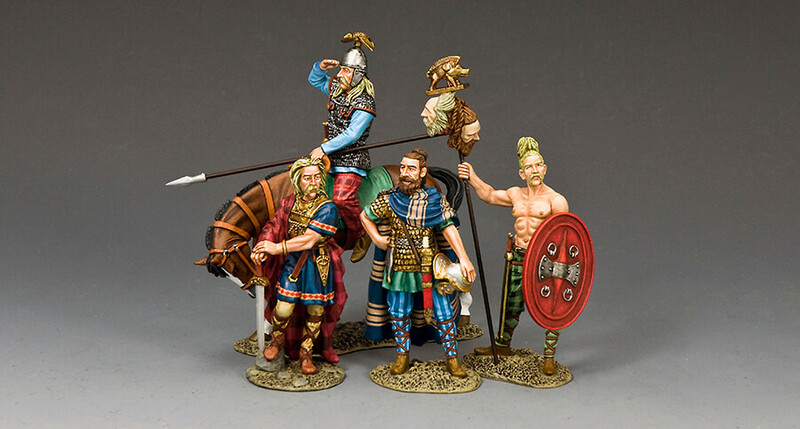 An important feature of these new mounted figures is that the heads of the figures are mounted on a short metal pin that allows them to be swiveled from side-to-side or even exchanged with other similar figures to allow maximum variety and difference. This will enable some fortunate collectors to build as big or as long a column as they wish. This mounted officer raises his right arm to bring the column to a ‘halt’... Has he seen something in the distance or has his Indian Scout noticed something out of the ordinary...? Among the SIX future U.S. Cavalry mounted figures are… One more officer… A Bugler… A “Stars’n’ Stripes” Standard Bearer sergeant… A Regimental Flag Bearer sergeant… Plus, Two different mounted Troopers. 7. "PACIFIC MARINE SPECIAL EDITION SETS"
In addition to our regular U.S.M.C. in the Pacific during WW2 K&C are offering a Limited number of ‘SPECIAL EDITION SETS’ showing our ‘Leathernecks’ wearing a mix of Marine Corps ‘Frogskin’ camouflage jackets and pants with the normal USMC HBT Fatigue Combat Uniforms. During the Pacific Campaign Marines would often ‘mix’n’ match’ with whatever was clean and available at any given time. These THREE ‘SPECIAL EDITION’ SETS add an extra degree of authenticity and realism to any USMC collection… Grab’em while you can. As one ‘Leatherneck’ blasts away with his Combat Shotgun, An NCO orders his Flame Thrower Marine to let loose at an enemy pillbox. A kneeling ‘Tommy-Gunner’ and a standing rifleman provide covering fire as the Marine with the BAR runs forward. USMC050(SE) "Eat this you sons of Nippon!”"
A kneeling BAR gunner fires off a burst as his buddy pitches a grenade at the opposition... the third Marine hits the deck! From the hot and humid tropical battlefield of the Pacific to the cold and freezing winter of the Western Front or the even more cold and freezing of the war in the East. WH092 "Sd.Kfz 250/11 Panzerbuchse 41"
We have only 100 of these great looking little German halftracks... perfect for any snow covered landscape... or collection. The Supreme Allied Commander wearing the short, waist-length jacket that was named after him ‘IKE’. DD294 "Texas Toy Soldier Show “IKE""
JN040 "Type 95 "Ha-Go" Light Tank "
The Japanese tank that spear-headed the invasion of Malaya, the Philippines and the Dutch East Indies... An important and vital part of the Japanese ‘blitzkrieg’. Our vehicle includes the tank commander. And that my friends is the story so far... at least for this month! Hope there are more than a few things you like here… If not there is always next month!